Successfully Added Fingerprint + Facial Recognition Attendance System - 300 Facial + 3000 Fingerprint Templates + 200000 Record Log to your Shopping Cart. 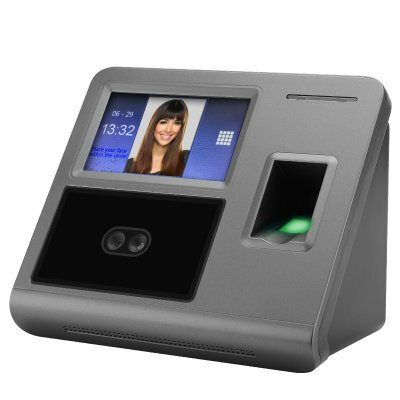 Fingerprint and facial recognition attendance and security terminal with 4.3 Inch TFT LCD, can store 300 Facial Templates, 3000 Fingerprint Templates and keep 200000 record history. As though out of a James Bond or Sci-fi movie this hi-tech biometric security and attendance systems incorporates both fingerprint scanner and facial recognition. Whether used to simplify attendance record keeping or tighten security for a sensitive installations or your secret bat cave this system can hold up to 3000 fingerprint patterns and 300 facial images for top notch security. With the fingerprint identification you can easily monitor the arrival and departure of individuals and log attendance of a resident population or workforce. Attached to an electronic door lock the terminal provides an added layer of security and prevents unauthorized access to secure locations only permitting registered users to gain access to apartment buildings, offices or locations you wish to keep secure. Facial recognition increases the security level and with a HD camera this system can accurately authenticate individuals based on their facial structure and appearance. When implemented in a place of work this data can be used to streamline human resources and record leave or sick days as well as effectively increasing punctuality, reducing HR overheads and streamlining attendance records. An intuitive user interface and software makes it easy to set up and for users to interact with and offers a high tech approach for any modern company. This product is in stock now, we guarantee next working day shipping and offer a 12 months warranty on all our products. Brought to you by the leader in electronic devices as well as wholesale biometric security terminals, Chinavasion.